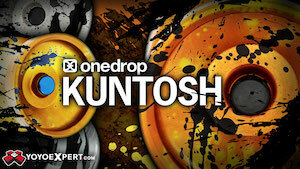 Guest post by André Boulay and sponsored by YoYoExpert. Every now and then a yo-yo comes along so unique and so special that it just makes you go ‘WOW’. Unscrew the capsule to reveal the new titanium SPACESHIP and you will understand why everyone is excited. Every element of design has so been carefully thought through including the artwork, the logo, the packaging, the extras. Not to mention the actual yo-yo design. This is a masterpiece. In the year 2088, our solar system will be under siege by the Nactaria: the most advanced alien species in the known and unknown universe. The Nactaria will have begun to devour the planets of our Sun the moment they reach the Kuiper belt. The only hope for Earth’s survival lies with the Eljasek alien species. Although out-smarted by the Nactaria on several occasions, they have finally discovered their Achilles heel weakness – TITANIUM! This rare precious alloy is fatal to the Nactaria upon contact which causes an instant spontaneous adverse reaction. The SPACESHIP was developed after an extensive research collaboration with the Eljasek and a gift to humanity. With 40 Titanium SPACESHIP yoyo’s deployed to earth, you can help protect our planet and improve your own game in doing so. The Nactaria have an acute sensitivity to old school yo-yo shapes. This prompted the Eljasek to design the SPACESHIP with classic influences of the yo-yo boom in the 2000s, pulling inspiration from the RecRev Bad Rep and Yoyofactory 401k. The SPACESHIP is made of premium Grade 5 titanium (Ti6-Al-4V), the only known titanium alloy that is able to trigger an anaphylactic reaction in the Nactaria upon contact. What does that mean to you? Absolutely nothing unless you happen to be in the wrong place at the wrong time during the Nactaria invasion. And if you are, you’ll be glad the SPACESHIP is your throw of the day. So will the good samaritans around you. The durometer of hardness and thermal resistance of the alloy ensures that zero damage occurs after contact with the Nactaria, so humans like yourself concerned with sustainability will be able to reuse the SPACESHIP infinitely. In laypersons terms and those who don’t want to think so hard, it’s that durable! Holding the delrin capsule just immediately feels magical. It’s smooth and slick and as you unscrew the top the excitement builds and doesn’t disappoint. Inside you will find a circular badge showing the number (1 of 40), a USB Flash Drive containing an actual SPACESHIP ‘alien font’ they designed just for the yo-yo, a small container holding nylon string and response, and then of course the yo-yo wrapped tightly in a nice cloth. The art on the capsule was done by the amazing Jason Week. Someone who appreciates a good yo-yo just like the rest of us. Each side of the SPACESHIP is engraved with really neat planetary style art and the SPACESHIP logo font for a package is truly out of this world. 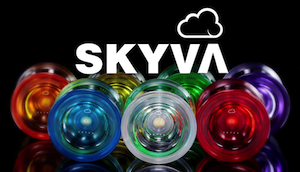 The Spaceship release Thursday night at 8PM EST at YoYoExpert. The Orbit is the signature yo-yo of 2-time Israeli Champion and 3-consecutive-time European Champion Tal Mordoch! Winning so many titles requires a lot of change, and the Orbit is tailored to Tal’s precise, well-controlled and constructive combos. The multi-stepped design gives it a wide catch zone to ensure a smooth landing and that little extra security for riskier elements. The weight is perfected to feel floaty with a powerful spin, allowing you to triumph through your long combos and technical tricks with ease! From the contest stage to #trickcircle, everyone is sure to feel your pull with the gravity of the Orbit! The Orbit is definitely optimized for Tal’s style of play…it’s fast and plays super zippy on the string, sliding around so quickly it barely feels like the string is touching the walls of the yoyo at all. The slightly smaller-than-average diameter of the yoyo makes it feel even faster, and allows for the just slightest bit of advantage when moving it through incredibly tight mounts and string segments. There is a ton of rim weight here, so even though the Orbit feels small in your hands, it packs a punch at the end of the string and gives you plenty of spin time to get through even your most complicated combos. The Duncan Orbit keeps it simple and functional with solid color anodizing (and just one fade), but the inner cup is filled with artwork inspired by 1960s retro sci-fi illustrations. The fit and finish are great, and the engraving is a super-fun nod to yo-yo’s “golden era”. The profile of the yoyo is simple but thoughtful, and was clearly developed with specific input from Tal to really mesh well with his precise style of play. The Duncan Orbit retails for only $44.99, making it a super affordable contest throw or an easy splurge for the casual player. If quick, technical play and a slightly smaller yoyo sound like your jam, this is definitely a great value. The Duncan Orbit is available now at YoYoExpert.com. The Zeppelin is designed with luxury in mind. It plays and looks as stunning as any expensive high end model, but it was created with an economical approach in mind that won’t break your bank. It was a long road to get to the final Zeppelin design – After a lot of prototypes and rejected versions it is finally complete and you can really feel all the hard work that went into it. Everything from the shape to the color to the design aesthetics on the Zeppelin looks immaculate and it has the performance to match! The Zeppelin is a solid, stable throw with a luxury feel and plenty of speed. It’s almost too easy to keep the Zeppelin on-plane during tricks, which is quite a feat considering that that profile is such a comfortable, rounded, semi-organic shape. Without pushing an extreme v-shape, Mythril has created a yoyo that can handle all the competition tricks you can throw at it while still feeling comfortable enough to be a daily knock-around throw. There are some yoyos that push you towards a certain style of play…the Mythril Zeppelin really works well as an all-around throw, and it’s a perfect addition to anyone’s collection. The Mythril Zepplin keeps it simple and classy with no logo engraved on the yoyo itself, but a sharply domed hub and a single silver circle engraved around that hub. The result is almost startling simple, bordering on iconic, and it really lets you focus more on the actual shape of the yoyo. Free of distraction, the Mythril is a player’s yoyo, meant to a workhorse for your day in, day out play. The simple aesthetic (done really well) combined with quality machining and anodizing, makes this a stand out in the budget metal price range. The Mythril Zeppelin retails for $65 and is a bargain at twice that price. It’s absolutely remarkable what Mythril YoYos has accomplished with this design at such an affordable price, and this is very quietly one of the absolute best deals out there. This yoyo is going to bring you good play time for years to come. The Mythril Zeppelin is available now at YoYoExpert.com. C3yoyodesign has one of the most well-rounded and complete product lines on the market, with something for nearly every taste and need. Magic YoYo has one of the largest ranges of entry level price points for a variety of styles. The two companies met years ago at a contest in China, and hit it off. After bumping into each other again last year, they decided to work together on a new model and we got the Vapormotion, a new fingerspin yoyo designed for high performance at a low price. The C3yoyodesign x Magic YoYo Vapormotion is a full plastic/metal hybrid, something we haven’t a lot of since YoYoJam closed up shop. An incredibly minimal plastic body holds together two large metal side panels that act as both weight rings and fingerspin cups. The C3 x Magic YoYo Vapormotion plays almost absurdly fast! Fans of a quick, light play style will absolutely adore the Vapormotion as it’s perfect for zipping through a ton of tricks quickly with a light touch on the string. It definitely feels like a 64 gram yoyo on the string, with that unique hybrid feel that’s bi-metal performance at a bargain price. The spin time is pretty excellent, thanks to the extreme weight distribution created by the large metal cup design, and as you can imagine it’s fantastic for fingerspin tricks. If you’re looking for a fingerspin yoyo, you’ve found it. If you’re looking for something that is stable and fast for speed combos, you’ve found it. If you’re looking for something that really doesn’t feel like any other yoyo released in the past couple of years, you’ve found it. The C3yoyodesign x Magic YoYo Vapormotion retails for $45 for solid colors and $55 for acid washes, making it an easy purchase for casual players and an affordable competition model for serious players who will need a half-dozen of them for contests. Fans of C3 and Magic YoYo should cop this yoyo immediately, fans of Ethan Wong Wing Hang should cop this yoyo immediately, and anyone who just loves unique yoyo design and great play should cop. this. yoyo. immediately! The C3yoyodesign x Magic YoYo Vapormotion is available now at YoYoExpert.com. C3yoyodesign has one of the most well-rounded and complete product lines on the market, with something for nearly every taste and need. The Bastet fills the void left by the retiring of the Capless, giving C3yoyodesign a classic, organic shape yoyo that pairs an old school feel with modern performance capabilities. The C3yoyodesign Bastet feels big, plays light, and holds spin better than the average organic shape yoyo. C3’s clever working of the profile and inner cup design allow for weight to be moved just a tiny bit more towards the rim while still keeping the aesthetic of a yoyo with uniform wall thickness. The cut in the profile is clearly visible to the eye but almost unnoticed in the hand, allowing for a wide gap that can handle modern tricks easily. The result is a yoyo that looks and feels organic but has the spin and stability of a more v-shaped design. The weight balance is exceptional, giving the Bastet a light, floaty feel on the string without sacrificing performance. Many modern players seek yoyos that are more like “comfort food”, with the look and feel of the classic designs that they started with…but their tricks continue getting more and more complicated. The C3yoyodesign Bastet expertly bridges that gap between nostalgia and performance. C3yoyodesign has done a great job with the Bastet, creating a profile that is deeper and more interesting than a typical organic shape. By keeping an uninterrupted curve for most of the rim, the yoyo feels rounder in the hand than it actually is. The cuts in the profile are subtle and keep it visually interesting without looking awkward or forced. The inner cup of the yoyo has a massive space for engraving, and a subtle double-cut transition from the flat face to the upper wall, which breaks up the look just enough to keep things interesting. The Egyptian-inspired engraving is well done and stands out among other yoyos on the market, and the anodizing is top notch, as we always get from C3yoyodesign. The C3yoyodesign Bastet retails for just $45, making it an easy purchase for even casual players. Fans of C3 should be able to afford to scoop this up without hesitation, and it’s a great addition to your case or collection at a super reasonable price. The C3yoyodesign Bastet is available now at YoYoExpert.com. Rain City Skills is a new skill toy company founded by Jeremy McKay and his wife Andra! After telling Andra about his trip to visit the One Drop shop in Eugene, she had the idea of starting up a high end skill toy brand. They combined their skills; Jeremy had the years of experience playing with skill toys and was connected with the community and Andra put her art school degree and years as a professional flow toy entertainer to work. Each toy released by Rain City Skills is the result of collaboration with experts in each field, extensive testing and carefully thought out artistic design. This yoyo design is focused on supporting North American industry. Machined by One Drop, anodized by Gruntbull and assembled with Monkeyfinger bearings, handmade string and snot, this yoyo represents the North American yoyo scene in every way. The Hipster Highlife is built for competition while keeping comfort and style in mind. It has smooth curves, a rounded profile, and the perfect weight distribution for long spins and stability. And for more fun, Rain City designed the hub with a Lego compatible nub; each throw will ship with a pair of Lego pieces that match the yo-yo theme, as well as spares that will let players tweak the center weight of the throw. And, staying true to it’s name, each Hipster Highlife is packaged in a hemp bag inside of a mason jar. What’s more hipster than that? The Hipster Highlife has extra fat and comfy rims, so the first thing you notice is how great it feels in your hand. Those beefy rims bring plenty of rim weight to the game, resulting in a yoyo that throws heavy but plays light and always seems to come back with more spin than you’re expecting. The wide v-shaped gap makes landing pretty much anything a breeze, and it rejects string well if you’re into those type of tricks. It’s a solid all-around player…great for contests or for just bumming around and grinding all that ano off fulfilling Walk The Dog requests. The Hipster Highlife come with Monkey Snot flowable silicone installed for response…as with all flowable silicone give yourself some time to break it in! Those first few binds can be a little grabby until the silicone wears in a bit…so watch your knuckles. The Hipster Highlife comes in multiple colorways (Starving Artist is shown below), all of which look great in person and are the product of top-notch anodizing. But where this yoyo really sets itself apart is the Lego-compatible side nubs that allow for practical modifications (there are Lego pieces that work nicely for fingerspins!) or for more aesthetic modifications…go ahead, put Darth Vaders head on there. Why not? The fit and finish on the Hipster Highlife is great, and even without anything else snapped on to those hubs, it’s a good looking yoyo. The Hipster Highlife retails for $109. It’s a fair price for this kind of play and quality, but the pile of extra Lego pieces and the glass jar packaging really put this over the top. The presentation on these is top notch, and the silly fun of snapping Lego bricks on your yoyo cannot be overstated. The Rain City Hipster Highlife is available at YoYoExpert.com. The Basecamp Navigator is the newest collaboration between CLYW and YoYoFactory, and the first bi-metal design from Basecamp. Designed for serious competition, the Navigator was designed by pulling features and inspiration from several competitor-focused YoYoFactory and CLYW yoyos used by players to win titles all over the world. This design direction, plus the addition of brushed stainless steel rims for superior weight distribution make this easily the most competition-oriented model in the entire Basecamp line, and one of the more exciting new contest yoyo releases. The Navigator really is an incredible contest yoyo. It’s got all the speed and stability you would expect of a bi-metal yoyo, but where it really shines is horizontal play. Even without a cupped area for finger spins, the Navigator really excels at horizontal play. With its extra flared gap, zero wall response, and massive concentration of rim weight, an experienced player should have no problem pulling off their most extravagant horizontal combos with this yoyo, and even players new to horizontal play should find themselves progressing quicker than they thought possible. The brushed finish on the rims is a nice touch that prevents that drag that is common to bi-metal yoyos when they hit your hand during play. As you can see from the comparison image below, the final look of the Navigator combines a very functional YoYoFactory H-shape with the stylings and curves more common to CLYW, and the result is a stunning blend of form+function. The fit of the stainless steel rims is impeccable, and the matte finish gives the Navigator a premium look and feel. The engraving is minimal, but the Basecamp word mark on just one rim is a really nice, subtle touch. The Basecamp Navigator retails for $120. For a high quality competition yoyo that draws inspiration from some of the most decorated competition yoyos in the world, that seems like a pretty good deal. If you’re on a budget, there are plenty of other options but you won’t find much better in the bi-metal category. Not a casual purchase, but then again it’s not a casual player. The Basecamp Navigator is available at YoYoExpert.com. The YoYoBrothers Heritage is the first ever release from yoyo collector and contest organizer Matthew Wright. The Heritage is a zippy yoyo, great for speed combos and horizontal play, with a ton of concentrated rim weight. The Heritage shape combines organic curves with an open catch zone and perfect width. The distribution of weight makes for a very versatile and stable yo-yo with a speedy, long lasting spin that handles fast directional changes with ease. Whether you’re playing relaxed, patiently forming new tricks, or blazing through contest freestyles, this yo-yo is built to perform on every occasion! The YoYoBrothers Heritage is available in limited quantities in four colorways; three signature editions for the YoYoBrothers sponsored players, and a special edition for YoYoExpert. The colorways are a nice spread of finish styles, which makes it easy for anyone to find a colorway that jumps out at them. The anodizing is really well done, and the colors are crisp. The YoYoBrothers Heritage is a collector’s piece available in very limited quantities, so the $110 retail is pretty reasonable for what is sure to be a rare throw. The performance is definitely competition quality, so the price is worth it for a yoyo that rides the line between function and collectibility. The YoYoBrothers Heritage is available at 8:00 PM EST – Wednesday – December 28th, 2016, at YoYoExpert.com. The YoYoFriends Pioneer is the first release from the China-based company. A great all-around yoyo, it’s a solid first release from a new company. The YoYoFriends Pioneer plays floaty and fast, and really zips around quickly on the string. The fatter, well-rounded rims give it a comfortable feel in the hand, while tapering down quickly to a wide gap that handles modern play easily. The Pioneer is incredibly smooth, has tight, zippy, binds, and has a flat inner cup that allows for fingerspins fairly easily. It’s got enough rim weight to handle casual play, and is a great knock-around yoyo for everyday use. Available in various splash and fade colors, the Pioneer looks really nice. The anodizing quality is good, the various finishes are all well done, and while the overall shape and profile are not eye-catching, the yoyo looks and feels nice. There’s a lot to be said for a simple design, and the Pioneer gets the job done without any flash or bang. The YoYoFriends Pioneer retails for about $25 USD, although it hasn’t really found its way to a wide retail release yet. It’s a great bargain yoyo, perfect for everyday, knock-around play, and a great first buy for players looking for an inexpensive, unresponsive, metal yoyo. Follow YoYoFriends on Facebook for more details!